The sandbag for pros. Now includes exclusive Online DVD with introduction video, training plans and realtime-workouts! The blackPack PRO is the versatile top model, addressed to those who look for a sandbag which they can un-/load quickly, and that provides durability, even under outdoor conditions. The blackPack PRO comes in one universal size. The user determines the final training size and weight. 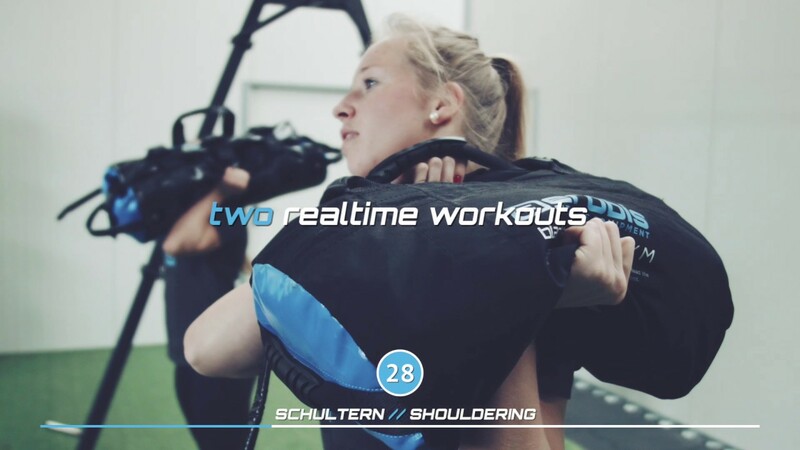 Whether 5 kg or 40 kg – all you need is this one training device! The blackPack Loading-Bags greatly simplify the procedure of changing the weight. The blackPack PRO can be loaded with up to three of the included blackPack Loading-Bags SAND. The blackPack PRO has a large opening to greatly simplify its loading and unloading. For additional simplification, this opening is provided with a magnetic closure. Thanks to the compression belts you can fixate the inner weight mass, in order to make your training device as compact and stiff as possible. The various attached handles permit gripping this training device with the hands close together, wide apart or diagonal. Other handles for strengthening your grip are also standard with the blackPack PRO. This training device is designed with a top opening for easy loading with weights. Its underside has a smooth surface, giving you all the advantages of an effective and safe training as close to the body’s center of gravity as possible. Due to the connector loops of the baton handles, you can connect the blackPack PRO with aeroSling sling trainers, thus, create lots of new, challenging exercises. Even floor training can be enhanced by using an attached aeroSling sling trainer as the universal tension force. The blackPack PRO is designed to last. Its robust skin from PVC withstands floor pulling exercises, water, and UV-light. The seams bear up to high loads and maximum demands. Each of the three Loading-Bags SAND can be loaded up to 12.5 kg (27.5 lb) sand. The Loading-Bag AQUA can be filled up to 40 l water. The Set TOP allows for all kind of exercise variations, as it comes with three Loading-Bag SAND and one Loading-Bag AQUA.